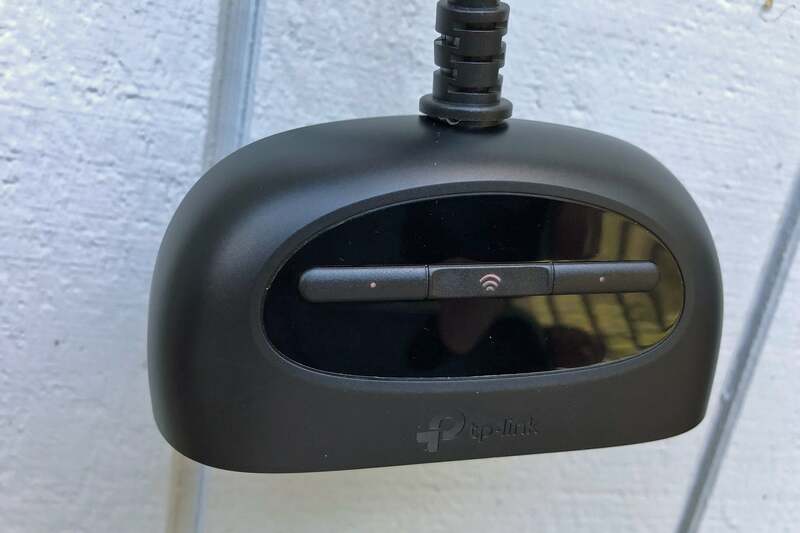 Dealing with devices plugged into outdoor outlets can be challenging, and we don’t know of any in-wall smart receptacles rated for the job. Their internal electronics just can’t tolerate damp conditions, freezing temperatures, and blistering summertime sun. That’s where pig-tail smart plugs like TP-Link’s Kasa Smart Wi-Fi Outdoor Plug (model KP400) come in. The bad news is that these types of smart plugs carry premium price tags. The good news is that TP-Link’s KP400 is not only more capable than the competing iDevices Outdoor Switch we reviewed last December, it’s also a whole dollar cheaper. The KP400 isn’t much to look at, though few outdoor-oriented tech products are. Built as a bulky crescent with a short, three-prong pigtail snaking out of it, the unit’s most noteworthy features can be found on top of the plug. Here, an illuminated indicator tells you whether the plug’s Wi-Fi connection is active, and two sizeable buttons offer independent control over each outlet. The placement and size of these buttons renders them easy to access and to activate, even if you’re wearing gloves. Easy-access buttons on the top of the KP400 make manual on/off operations a snap. Each of those power buttons also contains a tiny white LED—just a pinprick, really—that informs you whether the outlet is electrified or not. Those indicators are difficult to see, but they’re better than nothing. 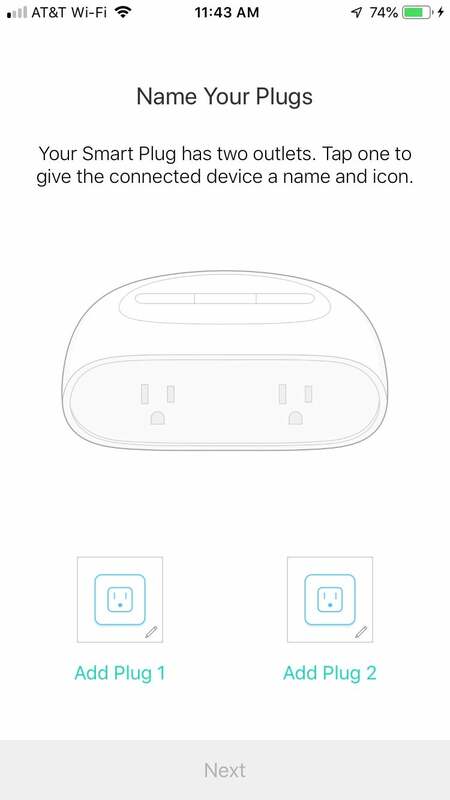 The competitor from iDevices not only lacks any power indicator, its two outlets can’t be controlled independently—they’re both either on or off. Unused outlets are covered by a rubber flap, which doesn’t feel 100-percent weatherproof but is probably good enough for most environments. (TP-Link puts the plug’s weatherization at IP64, meaning its impervious to dust incursion and that it can withstand splashes of water from any direction; in other words, don’t hose it down). Note that the outdoor outlet you plug the KP400 into should itself be protected by a bubble cover, and that outlet should also be on a GFCI circuit for safety. Using the TP-Link Kasa Smart app, you can name each of the outdoor smart plug’s outlets independently. You’ll need the Kasa mobile app—available for Android and iOS—to remotely control the KP400 via your Wi-Fi network (the plug itself is limited to operating on 2.4GHz networks). It’s not the most elegant app, but it’s easy enough to set up new gear and to operate products once you’ve registered an account. As with Kasa’s in-wall outlets, you can give each socket its own name and icon (or a photo), making it easier to figure out what you’re controlling. Products can be grouped as a scene (either both outlets together or in tandem with other Kasa smart home devices), so if you want to turn off all the Christmas lights at once, you can do it with a single tap. Automated schedules can be configured within the app, but it should be noted that schedules can only be set for individual products—not groups or scenes. The KP400 currently supports Amazon Alexa, Google Assistant, Microsoft’s Cortana, and IFTTT. TP-Link announced its intention to add Apple HomeKit support to its Kasa Smart product line at CES in January, but it hadn’t delivered on that promise at the time of this review. 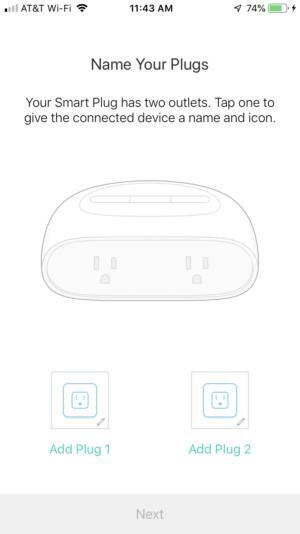 If you consider HomeKit support critical, you’ll be better served by the iDevices Outdoor Switch for now (the iDevices also offers energy monitoring, where the KP400 does not). 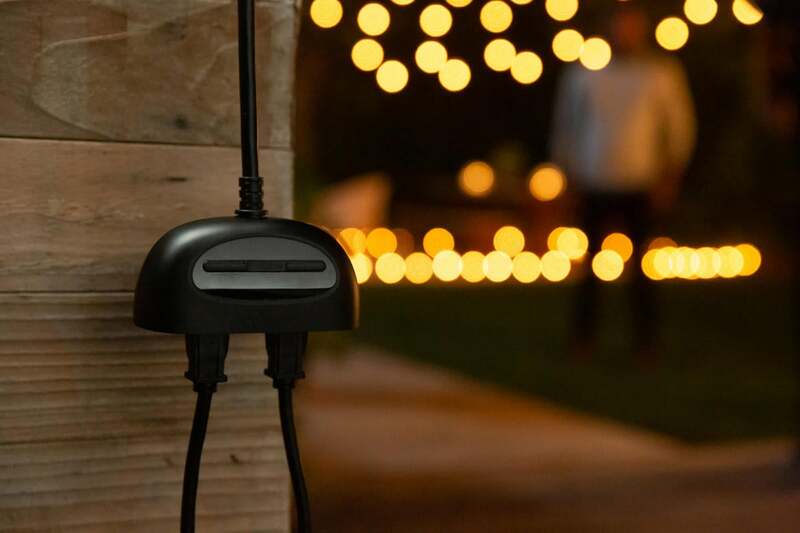 You’ll encounter more generic outdoor smart outlets priced considerably less than TP-Link’s KP400, but there are enough compelling upgrades here—as well as a comforting level of quality—to justify paying the premium.